This chronicle is from our recent tour to Coorg through Mysore.. Mysore, known as city of palaces has many places to offer for tourists who are interested in history. 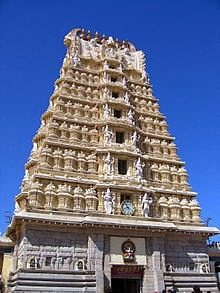 It is famous for Mysore mallige (jasmine flowers), sandalwood artifacts and silks. City got its name from 'Mahishasura' an evil king who ruled the place. It was known as 'Mahishasur', which got changed to 'Mysore' by British. Mysore was ruled by Vijaya nagara empire followed by Tippu Sultan before handed over to 'Wodeyar' family. Chamundi hills: This hill has 'chamudeswari' temple and you can see a big Nandi statue on the way to the temple. This Nandi statue is made of single rock. Chamundi hill is also known as 'Ashtamukhi hill' as it used to look same from all the eight sides of the hill. Mysore Palace: It is a three storied palace with gold coated cover on the top. It has 5 entrances. This is the official residence of royal family and it has durbar known as 'Amba vilas'. The construction and architecture is excellent and it is also famous for light show. When all lights are on, we cannot explain it's beauty in words. Lalitha mahal palace: This is second largest palace in Mysore which is on the way to Chamundi hills. We might have seen this white palace in many south Indian films so far.. It's very famous and looks regal. Jagan Mohan Palace: This was first used for the marriage of king 'Krishna raja Wodeyar'. When Mysore palace was undergoing repairs, royal family used this palace as residence. St. Philomena's church: This church was built in the honour of St.Philomena. Architecture is unique in Neo -gothic style. One of the must see places in Mysore. Brindavan Gardens: One cannot say their trip to Mysore complete until they visit these beautiful gardens. These gardens were planned and built in connection with construction of Krishnaraja sagar dam. It has beautiful botanical parks, many fountains and also boat ride. To reach the gardens, we have to cross the dam. It will be wonderful in the evenings with cool breeze from dam. 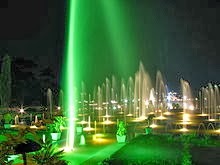 Musical fountain and Laser shows are other important attractions in the gardens. Mysore is famous for Dasara celebrations and processions by King. Usually, lakhs of people from different places of India come to participate in these Dasara celebrations. As you might have known, the last king of Wodeyar family, Narasimharaja Wodeyar died recently. I hope this tradition of Dasara celebrations continues in future.